Yesterday I left the house to make some photos of the Wabash River from overhead. On the way home from the zoo with my daughter I noticed that the ice was flowing pretty heavy down the river. I thought that I could look great from directly overhead. I will have more on that tomorrow. When I had made my picture I jumped in the car to warm up a little. 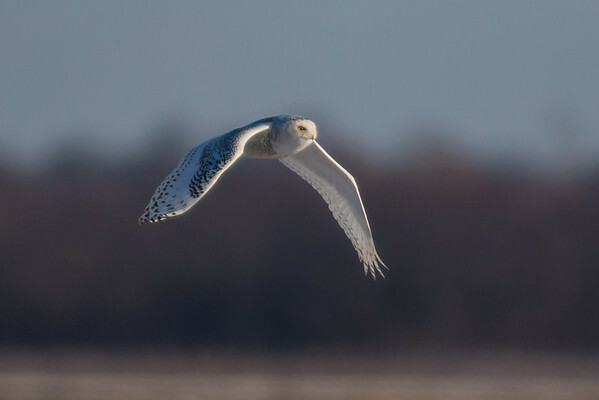 I decided to check on the snowy owl sightings to see if our friend up north was still there. There were recent sightings so I happily made the drive up there to see it. I had my 400mm lens in the car in case I came across any bald eagles. When I pulled up to the area I saw one familiar car driving away, and a new car parked with someone looking into a field with some big glass. 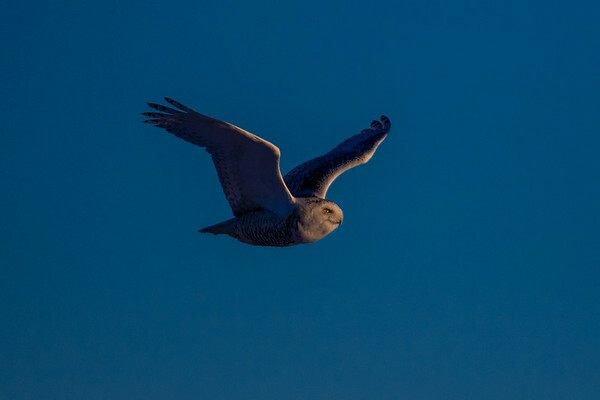 It turned out that it was a 1200mm lens pointed right at a snowy owl. The owl was too far away to do anything with so I waited…and waited…and waited. After about and hour and half the owl took off and flew to the barn near where I was parked. The photo above was one that I captured during that flight. I have plenty of static photos of the bird, but now I had some behavior! I am an action sports kind of guy so I like it when I get to track something. Tracking a bird this small at f/2.8 is a chore, but a fun one. 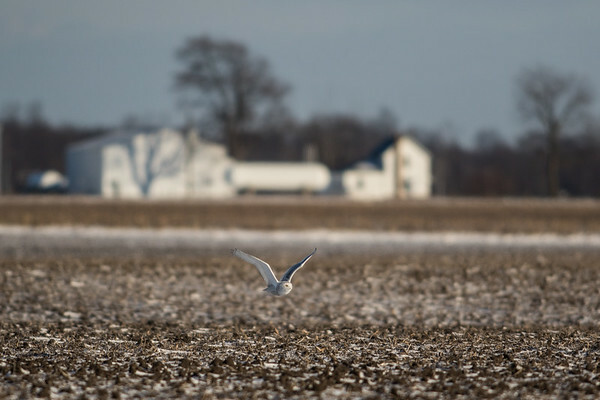 The flight was over almost before it began, and the bird was now resting on top of a barn. I moved down the road a little to photograph it there, but it was too far behind the barn. I drove down a side road near the area to see where it went, and I watched it fly the other way off of the barn. I then sat for over an hour again in a spot where I had the light working with me and waited for the bird to take off again. Right about when I was ready to give up it took flight again. I flew right by me and landed on top of a telephone pole. A little patience on the day resulted in two great opportunities to get some shots of the owl in action. At this point the light was almost gone, but the timing was perfect. I love shooting sports. There is no doubt about that. On a weekend like this one where nothing was going on though I had a void to fill. 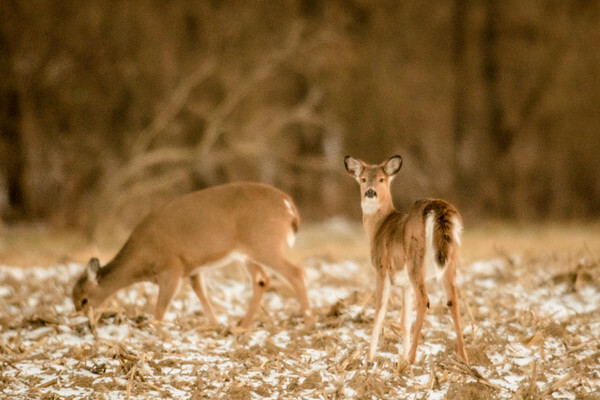 Photographing wildlife is a great way to fill that void. In sports you get excited when you make ‘the shot’. In wildlife photography you wait a lot longer for moments so when you get them it is even more exciting. This was a fun way to spend a couple of hours out in the middle of nowhere. Soon the owls will go back north, and this opportunity will be gone. As I was heading home I saw a couple of deer out near me in a field. I grabbed my 400mm again and made this picture out of my window. It will never win any awards, but it was fun to make. I know how hard it is to get these shots, so I really appreciate them even more. I was happy to see more of the owl. Thank you. They are beautiful and well worth the wait.